A loan of $725 helped a member to purchase hybrid seeds and fertilizer for the cultivation of maize. 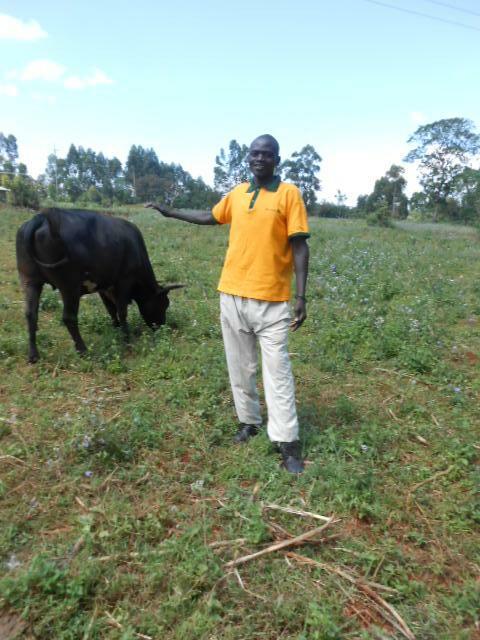 Pictured above is Samwel; often described as an extremely experienced farmer. He is 48 years old and, as a group leader, he is representing his group of 12 farmers in Webuye District, Kenya. He is married and has three children. Samwel is returning this season to work with One Acre Fund again, as this means that he is able to have access to quality training and acquire new farming methods, which is why he decided to join in the first place. Samwel says that he is happy to have made that decision because, since he first joined in 2013, he has had a healthier life due to better nutrition, which has improved his day-to-day life significantly. Samwel will use the profits from this season to send his children to school. The group will use this loan to purchase seeds and fertilizer to plant a total of 6.75 acres. Given that some members of the group will also be purchasing a solar light, with this loan, the group will also receive a total of two solar lights."